I think it may be safe to say that summer is finally here. The heavy liqueurs have been pushed to the back of the bar to make way for those ingredients that make the perfect warm weather cocktail. Peaches are in season, a sweet fruit that lends itself well to a variety of delicious drinks. 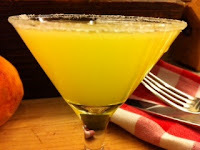 The Peach Martini is a treat for your guests, completing the summer BBQ or picnic. Directions: Muddle the vodka with the peaches and strain into a shaker. Add the simple syrup, ice and shake well. Strain into a martini glass rimmed with sugar.